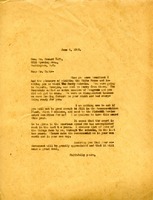 Martha Berry asks President Taft to fill out the Recommendation Blank for the Pictorial Review Award Committee. The award is given to an American woman based on her accomplishments over a ten year period. Miss Berry encloses a list of her accomplishments and asks for his recommendation in his own words.